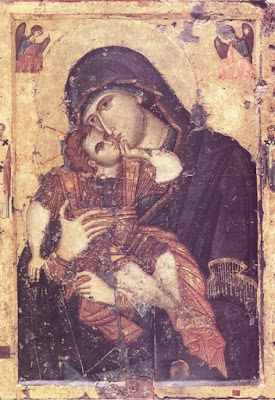 Like the Panagia Portaitissa, the Glykophilousa (Sweet-Kissing) Icon is one of those which were saved during the iconoclastic period and brought miraculously to Mount Athos. It originally belonged to Victoria, the devout wife of the senator Symeon. Victoria was one who venerated the holy icons, especially that of the Most Holy Theotokos, before which she prayed each day. Her husband was an iconoclast who found her piety offensive, for he, like Emperor Theophilos (829-842), found the veneration of icons distasteful. Symeon told his wife to give him her icon so that he could burn it. In order to save the icon from being destroyed, she threw it into the sea, and it floated away standing upright on the waves. After a few years, the icon appeared on the shores of Mount Athos near the Monastery of Philotheou, where it was received with great honor and rejoicing by the Abbot and Fathers of the Monastery, who had been informed of its impending arrival through a revelation of the Theotokos. A spring of holy water sprouted forth on the very spot where they placed the icon on the shore. Every year on Monday of Bright Week there is a procession there and blessing of water. Numerous miracles have occurred. Chapel built where the Glykophilousa Icon was found and a holy spring gushed forth. Another miracle took place in 1801. A pilgrim, after seeing the precious offerings around the icon, planned to steal them. He stayed in the church after the ecclesiarch closed it. Then he stole the offerings and left for the port of Iveron Monastery. There he found a boat that was leaving for Ierissos. After a while the ship sailed, but despite the excellent weather, it remained stationary in the sea. When the ecclesiarch saw what had happened, the abbot sent monks out in various directions. Two went to the port of Iveron and when they saw the immobile ship, they realized what happened. The guilty man who committed this fearful sacrilege asked for forgiveness. The monks were magnanimous and did not want the thief to be punished. Pilgrims from Berovo visited Philotheou Monastery around 1800. Elder Anthimos led them to the church where they venerated the Glykophilousa Icon, and the ecclesiarch narrated to them various miracles worked through the grace of the Panagia Glykophilousa to all those who approached it with faith. After this the pilgrims were led to their rooms to sleep for the night. That night at around midnight, one of them got up and wanted to prepare his horse for the next day, but due to his drowsiness from lack of sleep he walked over the edge of the cliff and fell on a bunch of rocks. As he was slipping and falling, however, he remembered the miracles of the Panagia Glykophilousa, and cried out, “Most Holy Theotokos, help me!” The Mother of God heard him and came to his assistance. The pilgrim landed on the ground completely unharmed, to the astonishment of all who later found him. After this the pilgrim visited the monastery annually to venerate the Glykophilousa Icon, and he offered to the monastery a horse and a silver oil lamp for the icon. Kyriakon of Philotheou where the Glykophilousa Icon is located. At around the same time an abbot of a certain monastery named Kallinikos took with him forty pilgrims from Ainos to visit Philotheou Monastery, hoping to arrive there by March 25th, which that year was a Kyrion Pascha, namely the day when both the Annunciation and Pascha land on the same day and are celebrated together. While they were on the ship towards Mount Athos, somewhere between Lemnos and Imbros, that night a storm arose putting all on board the ship in danger. While all were losing hope for their survival, Abbot Kallinikos did not lose hope, knowing that the Panagia has delivered many from similar dangers, and he encouraged everyone to beg for her help and not lose hope. As the ship was moving towards crashing into some rocks, suddenly the captain of the ship lost control of the rudder, and an invisible hand took control of it and led the ship to a sandy beach. It was then realized by all that the ship had been guided to safety by the Theotokos, and they landed on land across from Thasos between Xanthi and Traianopolis. From there they made their way to Mount Athos, and arrived at Philotheou, where they celebrated three feasts, namely the Annunciation, Pascha and their deliverance from the storm at sea by the Theotokos. A man and his wife from Ainos tried to have a child but remained infertile. Therefore he went to Philotheou and venerated the Glykophilousa Icon, taking from it some oil from the oil lamp. Returning home he anointed his wife with reverence and faith. Within that very year, the miracle took place, and his wife bore a son. To thank the Panagia, they offered a donkey to the monastery. The Glykophilousa Icon belongs to the Eleousa (Tenderness or Mercy) category of icons, where the Mother accepts the affection shown by the Child Christ. The icon is commemorated by the Church on the Sunday of Saint Thomas and also on Bright Monday. The icon depicts the Theotokos inclining toward Christ, Who embraces her. She seems to be embracing Him more tightly than in other icons, and her expression is more affectionate. The Icon is located on a pillar on the left side of the katholikon (main church) at Philotheou Monastery. Replica of the icon used for the procession on Bright Monday. On this day [Sunday of Saint Thomas], we commemorate the paradoxical receiving of the wonderworking Icon of the Most Holy Theotokos that is called Glykophilousa, which miraculously was granted to our Holy Monastery of the Venerable Philotheos, during the reign of Theophilos the Iconoclast. The most-precious Icon of Glykophilousa, which came to us from Byzantium, let us who have gathered venerate it, crying out: I behold you as a Mother of the Pantocrator, sympathetic, grant the gifts of your compassions to those who cry out: Rejoice, O Queen of All. Who can rightly tell of your goodness towards us, the saving appearances and gifts, O Virgin Theotokos? For your Holy Icon wondrously passed over the waves and was granted to us as a divine treasure, and a pledge of salvation. Through your invisible presence, you care for us, and you drove back the foreign army that had troubled your Mountain. Therefore, we celebrate a dual feast: the receiving of your wonderworking Icon, which we praise, and the deliverance from the tyrranical siege. We cry out to you: ever protect and keep us, as you are our protection and defender, as I call you the Most-blessed One. As the servant of the awesome mystery of the incarnation of the Word, O Ever-Virgin Theotokos, strange and paradoxical things were worked for our salvation within your womb, through your incomparable motherly goodness. For in your divine Icon, you appear full of sympathy, kissing as a mother, Him Who was incarnate through you, the Son and Word of God. This was given to us as a heavenly treasure, and was thus named “Glykophilousa”. As we celebrate its arrival, we cry out to you: Rejoice, O Full-of-grace, the Lord is with you, granting to us through you, the great mercy.